For a series of cartoons highlighting then Vice President Jacob Zuma’s colorful career, Zapiro was sued by Zuma for a staggering amount of money and Zapiro and his family were threatened by unknown individuals. Some of the charges have been dropped by President Jacob Zuma. But some of the charges are still pending. Learn more about Jonathan’s unwavering stand in our Sub-Sarahan section of our Art to Die For collection. CRNI’s 2006 Award for Courage in Editorial Cartooning was shared by Algerian cartoonist Ali Dilem, and the 12 Danish cartoonists whose cartoons depicting the prophet Mohammed caused an international uproar. 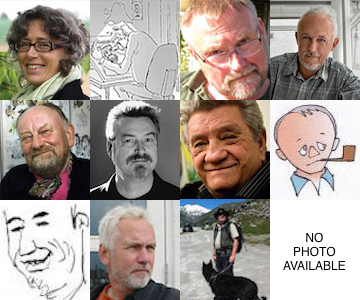 The story of the 12 Danish cartoonists who drew Mohammed was a global phenomenon, with tragic consequences. The publication of their work became a cause célèbre in both the western and Muslim worlds, where it was used to incite riots and violence that left dozens dead. For the cartoonists themselves, many have been forced into protective hiding, with religious extremists publicly calling for them to be killed for drawing the Muslim prophet Mohammed. Kurt Westergaard’s cartoon of the prophet Mohammed with a bomb in his turban is among the most controversial and fought over cartoon images in modern times. CRNI’s 2005 Award for Courage in Editorial Cartooning was given to Turkish cartoonist Musa Kart. 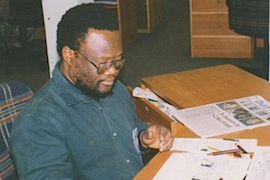 A picture on Namate’s Facebook page, taken in 1999, shows him at his Daily News desk drawing a cartoon. In April 2000 a homemade bomb was thrown at the paper’s office, and in 2001 a series of bombs were planted in the building, blowing up the printing press. In 2003 the paper, known for its critical views on President Robert Mugabe, was denied a permit and subsequently shut down. Tony was threatened, harassed and forced to leave several cartooning positions by high ranking administration officials. He and many of his newspaper colleagues however continued to defy excessive government censorship regulations. CRNI’s 2002 Award for Courage in Editorial Cartooning was given to Paul-Louis Nyemb Ntoogueé, aka Popoli (“the people”), from Cameroon. The award was given in recognition of his many years personal sacrifice in the face of repeated attempts to silence him, and as part of our campaign to spotlight his case, and bring additional pressure on those in power to relent. Popoli’s troubles with the government of President Paul Biya began in late 1991, when he was arrested and tortured for marching in a public demonstration for freedom of the press. Popoli was subsequently threatened with arrest in 1992, for a series of cartoons about government corruption, hiding in a swamp for 20 days until matters cooled down. He was arrested and interrogated again in 1996, before all charges were dropped. From that point onward, Popoli became the target of escalating threats of violence. In August 1998 two strangers assaulted the cartoonist at his office. A few days later Popoli fled the country after being tipped off that he would be attacked again, this time along with his younger sister. The day he fled the country, officers invaded his house and left behind the written threat that they would kill him by a thousand machete cuts if he continued to draw “disrepectful” cartoons of President Biya and the First Lady. Threats and pressure continued, escalating into violence again in late 2001, when Popoli was dragged from his car and severely beaten by Security Officers. Shortly afterwards he was arrested, ostensibly for a cartoon which referenced the First Lady’s long-rumored past as a prostitute.